Source 3 Development recently announced their intention to develop a $27 million mixed-use infill project at the northwest corner of Liberty Street and Elm Street. 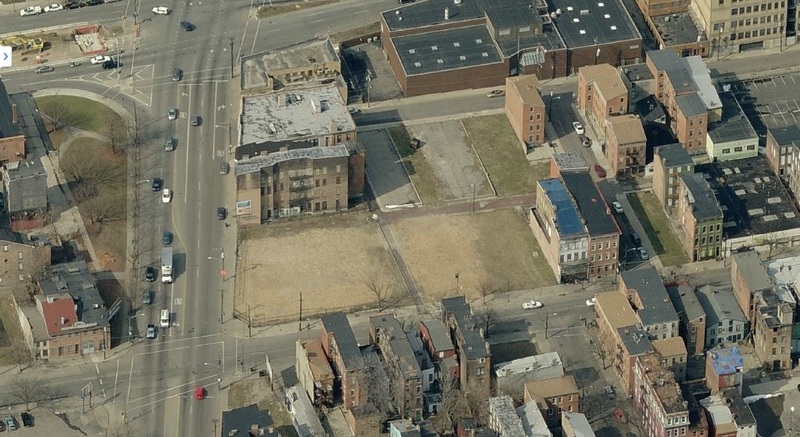 The project’s prominent location near Findlay Market and along the streetcar line, combined with its unusual large tract of cleared land, grabbed headlines, particularly as the developer promised to create 118 apartments and 15,000 square feet of street-level retail. All of the retail, and 90 apartments, will be developed in the new structure, the remaining 28 apartments will be developed within four historic structures that will be preserved. In addition to being bold, the proposal also illustrates the conflicts challenging Cincinnati’s development community as the city continues its rapid physical and social transformation. The site is large and includes an unusual amount of cleared land. Of course, this land used to be occupied by historic structures. Prior to the wave of investment that has changed the face of Over-the-Rhine, these historic buildings were left to decay to the point where City Hall issued emergency demolition permits for them. Since their demolition, the site has been used by Findlay Market as a community garden. Cincinnati developers continue to be challenged with building in historic districts. Often, new structures struggle with balancing contemporary design with a historic neighborhood fabric. When it comes to the historic structures themselves, there still seems to be a split in the development community about whether it is more valuable to tear down aging buildings, or spend the money to breathe new life into them. Until the understanding that historic buildings and urban fabric are what establish the value of neighborhoods like Over-the-Rhine, there will continue to be a conflict between those who wish to preserve the old, and those who think reducing the upfront capital cost is more valuable. The LibertyElm development is arguably located in one of the region’s most walkable neighborhoods, is served by numerous bus routes, and is surrounded by the Cincinnati Streetcar. Yet, while touting these facts, John Heekin, Principal at Source 3 Development, says that a concerted effort was made to provide enough parking to not only satisfy its new residents and businesses, but also address parking demands in the surrounding neighborhood. In order to accomplish this, a three-level, 165-space garage is included with the project. In fact, when asked about the possibility of adding more residential to the project, Heekin explained that while more apartments are being demanded, it is the provision of parking that is the limiting factor. In theory, this is absolutely where the streetcar should help. But in reality, this is where the neighborhood’s walkability, bikeability and existing bus service already help. In fact, City Hall has thought so much of these aspects that it has reduced minimum parking requirements along the streetcar line, and throughout the center. Heekin says that his development team is hopeful the project’s residential tenants will not have as much a need for cars, thus creating an opportunity to turn some of those spaces over to public use – perhaps for people visiting Findlay Market. But it is this hope, and lack of confidence, that creates such predicament for Cincinnati’s development community. While the city is becoming more transit friendly, many see the market still demanding one to two parking spaces per residential unit, and even more for commercial retail, which has become a regional draw in Over-the-Rhine in recent years. Having been focused on developing projects on green field sites in suburbia for several generations, challenging urban infill projects are still new to Cincinnati’s development community. This is made most obvious in Over-the-Rhine where development is at a fever pitch, and developers must deal with both the conflict of building new or preserving old, and developing around cars or not. Source 3 Development seems to be on the right track, as compared to many other recent development projects, but the conflicts remain clear. Heekin says they hope to break ground on the project this fall, with residents and businesses moving in a year after that. Perhaps between now and then, Cincinnati’s development community will become more comfortable with building truly urban projects that preserve and complement the city’s historic assets, and take full advantage of the walkability, bikeability and transit service offered throughout the city.